The Temple mount looked very different before the Temple was destroyed. The whole section of what is called Solomon's Stables, left of Triple Gate, did not exist at the time of the Temple. I believe this section to have been added to the Mount by Hadrian around 135 AD. So even though it looks like the bridge runs up along side the temple mount in the picture in fact it went up the hill and connected to Triple gate, which was once Solomon's Portico. I drew this digital bridge so that I could get an idea on the approximate length of the bridge. I also wanted to know the angle from the end of the bridge to the Holy of Holies and the angle from the Temple door to the top of the Mt of Olives. A friend visiting Israel actually measured the 2000 cubits for me, which is the distance required from the Holy of Holies to the Red Heifer Altar. The bridge is by no means exact, but gives a general idea. This picture of the sunrise on the Mount of Olives was taken on a very special the day before Passover in April 08, 2009. It is called the festival of Birkat HaChama and is celebrated once in a 28 year cycle. The festival is the blessing of the sun. It is noted that this is the day when the sun returns to the position it occupied when it was created at the beginning of the fourth day of creation. Because I was able to find this picture of that sun rise on Passover 2009 then I am going to use it as my example. 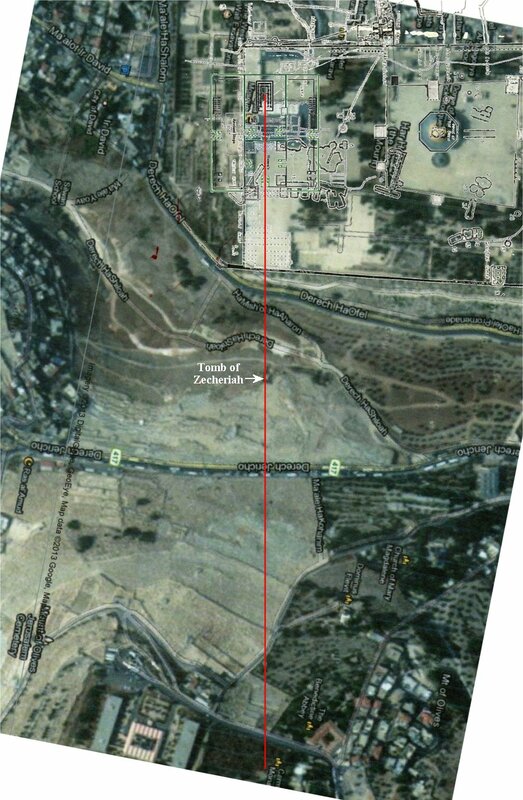 I have placed a yellow arrow on the picture (above) to indicate where the Holy of Holies would have been located in my theory, deep below the Temple Mount surface. The surface of the Temple Mount was much lower 2000 years ago than it is today. 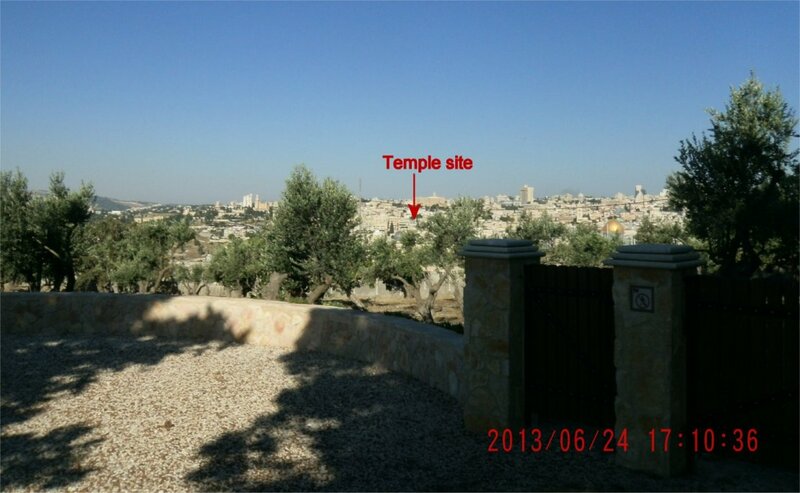 As you can see the sun would have shown directly into the Holy of Holies with the Temple at this location. It would not shine into the Holy of Holies of any of the other Temple theories on this Passover day. This shows the sunrise on this Passover is in the right position to shine through the Temple door into the Holy of Holies with my location for Solomon's Temple. I tend to believe that the Red Heifer Altar would have been built where the sun rose on that day when it would shine into the Temple door. 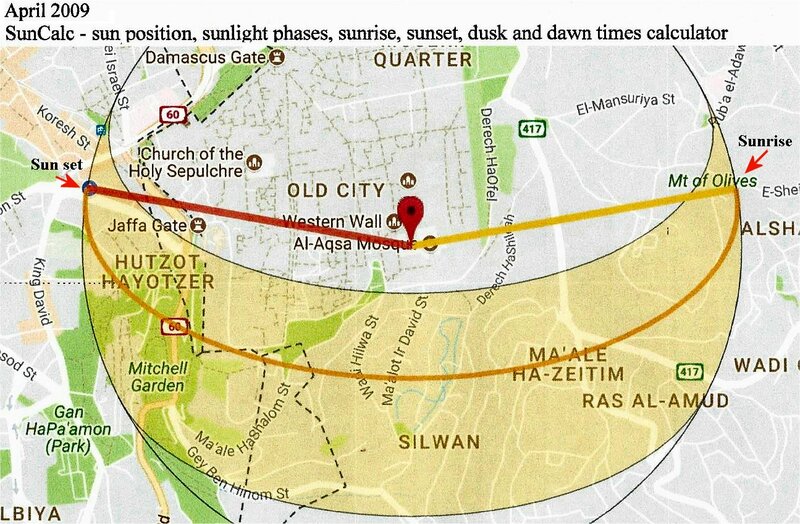 The sun will not rise in this exact position every Passover (every 28 years) because every three years or so the Jews add a leap month to their calendar making a 13 month year. To me this means that the Red Heifer sacrifice may have only been made during an acceptable year when the sun was in the right position. Only nine were ever made. The 10th would be made by the Messiah. This is important because the angle from the end of the bridge, on the lower part of the Mt of Olives, to the Holy of Holies must allow for a person to see through the East Gate, the inner east gate, and through the Temple door, seeing the veil that hung before the Holy of Holies. Also the Priest performing the Red Heifer sacrifice at the top of the Mount of Olives needed to be able to see the Temple sanctuary to know when to begin the sacrifice. So in this case he would need to be able to see over the top of the East gate and also over the inner east gate. The bridge is approximately 1,000 feet long and at around a 3 percent grade from the end of the bridge up to Triple gate (Solomon's Portico, which had the entrance to the East Gate within it). The way the bridge was constructed it allowed for air to be between the priest and the graves below. Living water had to be carried up the Mount to the Place of the Red Heifer Sacrifice. For this reason hollows (tunnels/caverns) were cut into the bedrock. Chosen women gave birth there, and the boys born in the hollow grew up there, never allowed to venture out, for fear of them walking over a grave. To get the water to the top of the Mt of Olives these boys were carried on large doors up the Mountain while holding rock hewn bowls full of living water. Can you imagine being under such strict laws like this? If the Jews in the time of Solomon used a smaller cubit to measure out the 2000 cu, or if they measured down into the Kidron valley rather than over the bridge, then the red heifer altar would have been built a little lower down on the Mt of Olives. This is always a possibility, however it is written that the altar was on the summit (top of the Mount as being directly east of the Temple). Near the end of the Red Heifer Bridge was the place of the counting of heads (skull) where papers were checked before the people could cross the bridge and enter the Temple from the East Gate into the women's court. Jesus would have been crucified with a view to the Holy of Holies. That is why the Roman soldier could see the veil as it was rent in two, and also see the tombs open and the dead coming back to life and go into the city. :51 And behold, the veil of the temple was torn in two from top to bottom; and the earth shook and the rocks were split. :53 and coming out of the tombs after His resurrection they entered the holy city and appeared to many. Mar 15:37 And Jesus uttered a loud cry, and breathed His last. :38 And the veil of the temple was torn in two from top to bottom. The centurion, standing in front of Jesus, need only turn his head to see the veil torn in two and the dead being raised and walking toward the city. This is only possible if Jesus was crucified on the Mt of Olives straight across from the Temple. In the east wall today we can see a blocked up gate. With my southern location for the Temple this blocked up gate is not the East gate to the Temple complex. The True East Gate was inside Triple Gate at an angle upward from this gate. This is a gate created after the Temple was destroyed in 70 AD. Created by Roman Emperor Hadrian around 135 AD. This enabled the southeast section he had added onto the Temple Mount to still be connected to the bridge that crossed the Kidron Valley that the Jews had built. Straight across the Kidron Valley from this blocked up gate is the, so called, tomb of Zechariah. 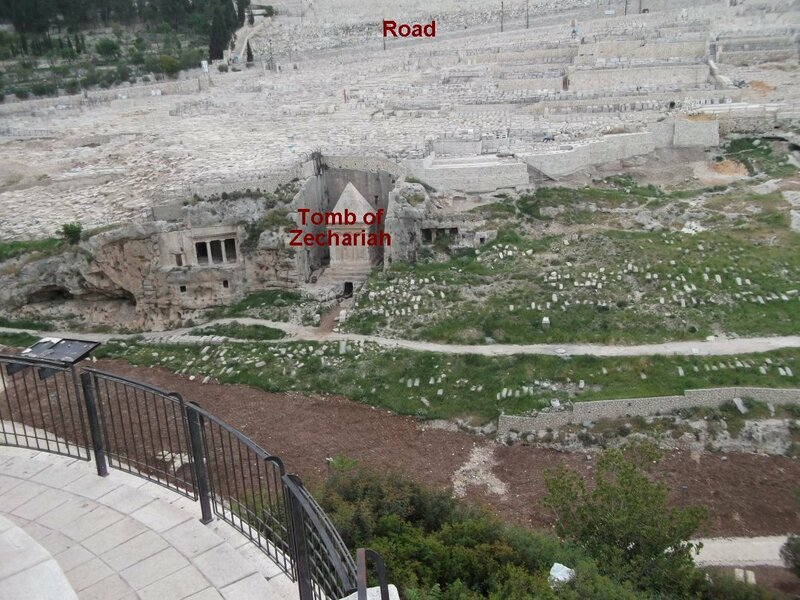 These tombs were actually made in the first century BC and had nothing to do with Zechariah. The monument between the Tombs is actually solid rock and is not a tomb. The Tomb to the left is from the second century BC and was the tomb of the Priestly family of Bnei Hazir. It seems possible that when the bridge existed it would have had a pier in the same place this monument now stands, either on top of the bedrock, before the monument was chiseled out, or perhaps this monument started out as pier of the bridge. It stands to reason that the Jews would have cut into the rock to create air between the rest of the cliff of rock just to make sure no tomb would ever touch the pier of the bridge. If this was the case then this may have been a monument chiseled out as a memorial to the bridge that once stood there, and fallen Temple. The first record I can find of this monument was in 333 AD by the Pilgrim of Bordeaux, but it was called the Tomb of Isaiah at that time. I have not been able to find any information as to when the bridge was destroyed. The Temple of Jupiter on the Temple Mount was destroyed in 325 AD by Constantine and the bridge may have also been destroyed at that time. Or it could have fallen in one of Jerusalem's many earthquakes. The stones would have been incorporated into buildings throughout the city. 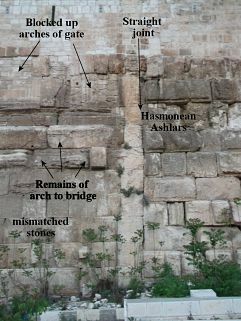 The Red Heifer bridge would have ended between Zechariah's tomb and the road to Jericho, straight across from the blocked up gate in the east wall of the Temple Mount. The place of stoning for the Jews would have been near by the end of the bridge, so that when a person died they would be before God (represented by the Holy of Holies) and they would be responsible for their own sins. It is said that the Centurion that stood guard across from Jesus at his crucifixion saw the torn veil of the Holy of Holies at the time, which means this is the same area the Roman's crucified Jewish prisoners. Jesus was one of three being hung on a cross that day, which further indicates this as a place regularly used by them. The Roman's always crucified people on the main roads going into cities that they ruled over as a warning to travelers, and this was sort of a crossroads with one road leading to the city and another leading to the Red Heifer bridge which lead to the Temple. They may have chosen a place above the road where He could be mocked by the travelers. When the Temple was built it was built according to True North, Not Magnetic North. I have noticed that the other theorists have begun to angle their temples, believing that the Temple Mount doesn't lay north to south. Perhaps it is caused by the use of a compass, GPS or Google maps. But there is a difference between True North and Magnetic North and even Grid North. A magnetic compass points to magnetic north, not geographic north. Magnetic declination is the angle on the horizontal plane between magnetic north (the direction the north end of a compass needle points, corresponding to the direction of the Earths magnetic field lines and True North (the direction along a meridian towards the geographic North Pole). This angle varies depending on position on the Earth's surface, and changes over time. The magnetic declination in a given area may (most likely will) change slowly over time, possibly as little as 2–2.5 degrees every hundred years or so. 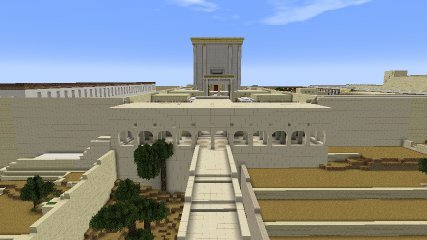 In other words, there is no reason to place the Temple location at an angle contrary to the outer walls. Solomon knew what east was. And those that built the courts and outer walls also knew what east was in their day. The huge steps in front of the south wall cut into the bedrock makes it perfectly clear that Solomon knew exactly where east was. They didn't have a compass to tell them where magnetic North was. They had the sun and moon and stars to tell them. The temple sat within inner walls and outer walls that all lined up to the four directions. So if you think the temple mount does not lay north and south according to a compass or GPS then adjust your compass to match up with the Temple Mount, not your temple to match up with your magnetic compass. Somewhere on the top of the Mount of Olives was once located the Red Heifer altar. No ruins of the altar remain, unless buried deep under cement or buildings. All I can do is show the distance of 2000 cu from my location and draw a red line on a map to show the approximate location. Certain instructions were given to Moses concerning the sacrificial altar of the Red Heifer. It was to be built "outside" the city. Outside the city was given as 2000 cubits (2,916 ft @ 17.5 cu) to the east from the tent tabernacle. It was to be made of un-hewn natural stone from the immediate area and have four walls, filled in with layers of stone until it had a flat surface on top. It must have a ramp, not steps, and a ledge around the altar on three sides and along the ramp down one side. From the altar the priest was to sprinkle the blood seven times towards the tabernacle. This is probably the best EXAMPLE of what the Red Heifer Altar might have looked like on the Mount of Olives. 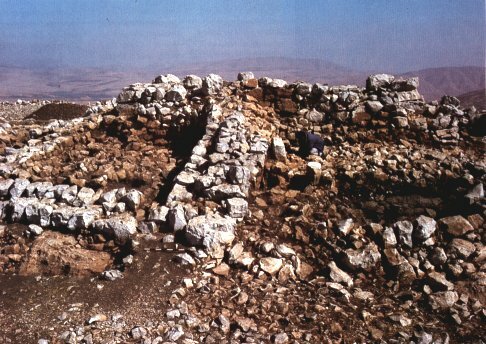 In 1980 by Adam Zertal uncovered an altar at Ebal Israel believed to be the altar of Joshua, with a later altar built over it. This altar had been purposely covered with stones to either hide it, or preserve it. It is 10 feet high and around 25 x 30 feet in width and length. The walls are 5 ft thick with a fill to make it flat on top. There is a 23 x 3 foot wide ramp leading up to it with the same ledge and smaller ramp along side the larger one. Beneath this altar is another smaller, 6.5 ft round, altar built on the bedrock. The smaller altar is thought by many to be the altar of Joshua that we read about in the scripture. It was built around 1250 BC. The larger, rectangle, altar above it is dated to around 1400 BC. The front portion of this altar had two large stalls where the animals were kept. Also different compartments were found within the stalls was used to contain the items needed for the sacrificing of the animals. 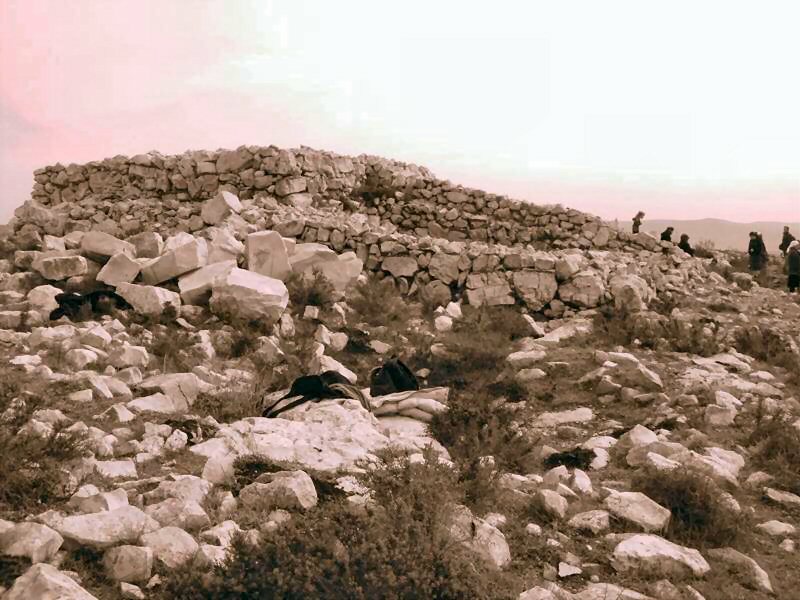 When the Temple was built in Jerusalem the altar on Mt Ebal was abandoned. With my southern location for the temple completed the next logical step for me would be to locate the approximate area for the altar of the red heifer sacrifice on the Mount of Olives. 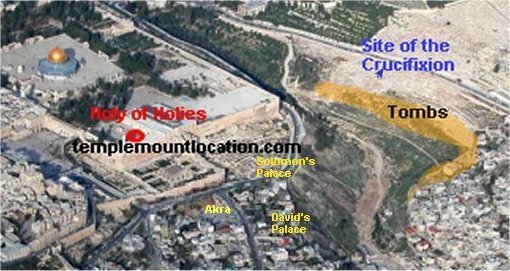 On the map below I had placed my diagram of Solomon's temple complex and drew a line from the Holy of Holies through the inner and outer east gates, and continued it to the summit of the Mt of Olives. This year a friend measured the mount on foot, using simple tools, starting at the backside of Zechariah's Tomb up to the summit. I then added my measurements from the Holy of Holies to the backside of Zechariah's Tomb to his (as if the bridge were there). 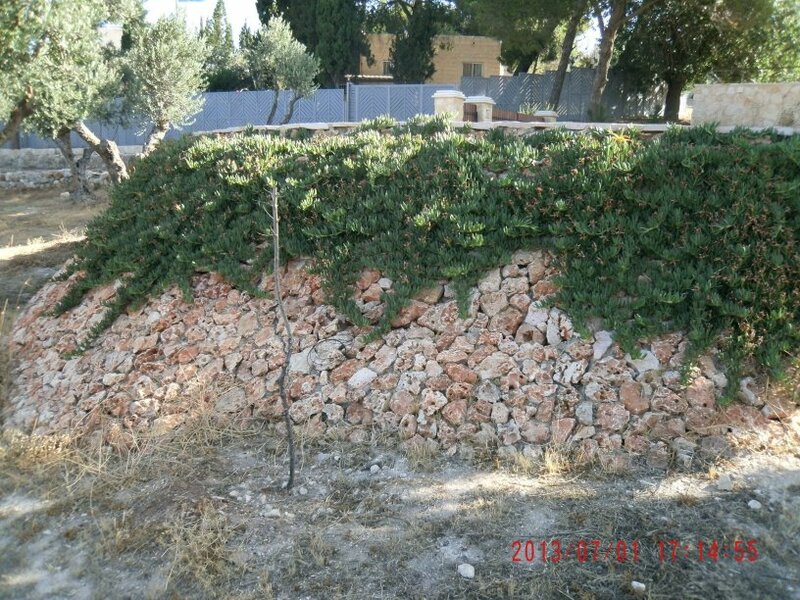 The approximate 2000 cu (17.5 cu) ended in the Carmelite Olive Grove at the top of the Mt of Olives. I used my diagram of Solomon's Temple in the map below, since Herod moved the location of the Temple house a little to the North. I also transposed Warren's map over this satellite view so that I could be as exact as possible. There is a very nice rest area at the north end of the olive grove, which just happens to be near my red line on the map above. From here one can get an idea of how far 2000 cu actually is. The Monastery built up the ground level for this particular rest area to make a flat surface for a large rounded rest area on top. I like the way the base of the rest area was made because it gives a feel for how an altar may have looked when built in this area, having to be built up higher on the west side because of the slant of the mountain. One must wonder if the Jews were able to bury the red heifer altar before the war in 70 AD, or if Titus destroyed it along with everything else. In fact even the churches built up here were destroyed by invading armies over the following centuries and were rebuilt many times. "After the siege of Jerusalem by Saladin in 1187, the Mount of Olives was given over to sheiks, who demolished the monasteries and many other buildings. Those churches that remained fell into utter desuetude. The area was totally devoid of human habitation until the 1860s, when Christians began to settle on Olivet again." The Russian Orthodox church purchased the land and began building once again. The area was later bought by a French noble woman in order to construct a Carmelite convent in the 19th century. If one were looking for the Red Heifer Altar now, they would have to dig, just as they have done for all the other ruins that have been excavated to date. Almost two thousand years of dirt blown in the wind would have settled over the ruins of the altar. From the top of the rest area you can see the Temple Mount, and the gray dome of the Al Aksa mosque in the far distance, but in times past one would have seen the Temple. View of Temple Mount from the Carmelite Olive Grove Rest Area. As you can see the only thing the priest doing the sacrifice would be able to see from this distance would have been the doorway of the Temple. Even with the camera on zoom, as in the photo below, very little can be seen. Most of the olive trees in this grove were planted by Father Parthenius in the late 1880's through 1906. But a few scattered about are very old and it is said that they grew from the roots of the original trees cut down by Titus when he cleared the Mt of Olives to fill in the moat on the Temple Mount in 70 AD. 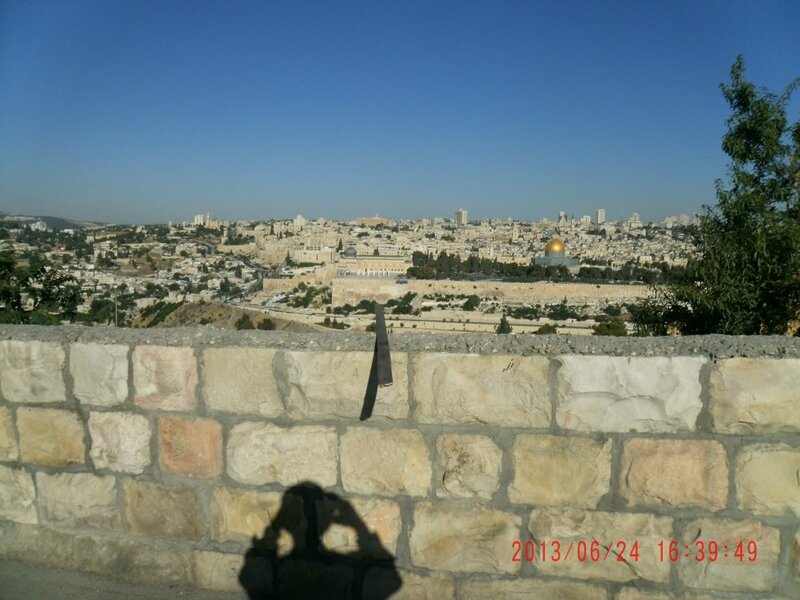 The photo below was taken from the road atop the Mt of Olives, in front of the wall to the olive grove. Even without the trees obstructing the view only the dark spot of a doorway of the mosque could be seen, and the Temple sat further back than this door on the mosque. Most likely the priest on the summit would see the shadow of the Mt of Olives receding as the sun rose and would know the moment the sun reached into the doorway of the Temple, and would then begin the sacrifice. It seems logical. It remains a mystery to me how the priests would have seen the High Priest standing in the doorway from 2000 cubits away, as some websites suggest.